Cars could have their speeds electronically limited by 2022, if the European Union makes good on its pledge to impose new safety standards. Intelligent speed limiters would become mandatory equipment, in the same way that anti-lock brakes, electronic stability control and tyre pressure monitoring systems have. CAR magazine tested Ford's nascent system in the S-Max back in 2016, when the system was newly introduced; it's now called Intelligent Speed Assist and standard on the big-selling Focus hatchback. How does it work, what does the driving experience feel like, and how do you over-ride it? Read on for the answers. 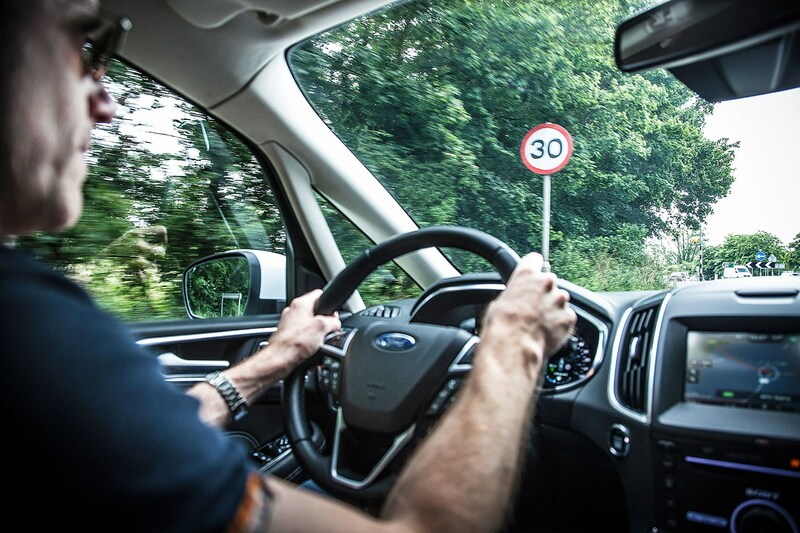 Ford’s S-Max has a breakthrough gadget – an Intelligent Speed Limiter (ISL), which can monitor the legal maximum speed and prevent you from exceeding it. The heart of this system (standard on all models bar the entry-level Zetec trim in 2019) is a windscreen stereo-camera, mounted ahead of the rear-view mirror. This scans the roadside ahead for speed limit signs, which are interpreted through character recognition software and relayed in the driver’s eyeline. So far, so routine. But ISL adds another layer: if you’ve activated the system via steering wheel-mounted buttons, the engine management system will restrict the supply of fuel, preventing acceleration even if you increase pressure on the throttle. The pedal becomes so unresponsive, you can almost press it through the floorpan but the S-Max won’t break its self-imposed limit. Ford has engineered a kick-down over-ride, but you must kick like a mule to activate it. The system doesn’t appear to use the brakes: if you pass from a 40 to 30mph zone, for example, ISL gradually throttles back your speed until you’re legal. Smooth stuff. What makes or breaks the system is the precision of its speed-limit recognition. It’s spot-on most of the time, but not infallible. On one 65-mile run, it missed a newly introduced, unobstructed 40mph sign, suggesting we sail on at 60mph. More disconcerting was imposing 40mph, just after the S-Max exited an A1M roundabout, almost certainly fooled by a different limit on a side road. So instead of powering back up to 70mph, acceleration stalled, as if the engine had hit its rev limiter. A hard kickdown over-rode the restriction. ISL is at its best around town, especially enforcing 20mph zones which may feel unnaturally slow and could be tempting to flout. In urban areas, it makes speeding feel socially unacceptable, which is an extremely good thing. Press this button twice to activate ISL and set the limit. You can toggle ‘tolerance’ to exceed the limit in 5mph increments, strangely. This forward-facing stereo camera scans for speed limit signs, feeds them into character recognition software and relays them in the speedo. Attempt to exceed the limit, and fuel supply to the engine will be restricted, no matter what the throttle position. You can lose track of throttle position, so when the limit lifts, you might launch on a torquey tide – or be mired in turbolag. That’s a qualified yes. It's well worth using in town and unfamiliar places. But it relies on roadside signs being highly visible, and positioned so as not to impose an incorrect limit from an adjacent road. Back in 2016, we commented that legislators would be tempted to make intelligent speed limiters mandatory, and that day has now dawned. Given the latest Department for Transport statistics suggest speeding, or travelling too fast for the conditions, was a factor in 339 accidents that involved a fatality in 2017, then equipping all cars with ISL could provide another useful safety measure in the fight against road tragedies. There would also be an efficiency saving, if more people stuck to the limit. But any ISL system needs to be sensitively tuned: a responsive throttle over-ride, to enable overtaking when conditions are safe, must also be included.